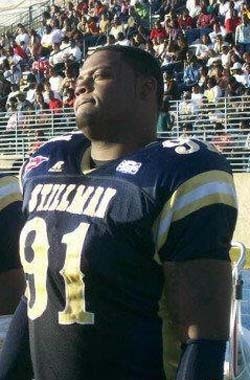 Rumors of college players visiting the Chargers continues, and with the defensive line being a position the team wants to upgrade, the club is going to talk to Sammie Lee Hill, a player that is pretty much unknown out of Stillman College. Below is the news on Hill talking to a number of teams like the Steelers from PFT.com. Little-known Sammie Lee Hill, a defensive tackle from Stillman College, quietly is getting noticed as the draft approaches. A league source tells us that Hill, who some think could be picked as high as round two, has scheduled visits with the Jets, Eagles, Buccaneers, Chargers, and Steelers. He also has met with the Patriots, Rams, and Chiefs. At 6?4? and 329 pounds, Hill has the size to play tackle in either the 4-3 or the 3-4 defensive alignments. The Good: A massive interior lineman who carries his weight well. Is an ideal nose tackle at the next level. Displays a rare blend of athleticism and quickness for his size. Possesses long arms and a devastating punch on contact. Eats up blockers inside, pushes the pocket and can control the double-team. Even lined up outside at times at Stillman and displays natural footwork and good burst out of his stance. An intriguing athlete who has a lot of upside at the next level. The Bad: Absolutely dominated his level of competition and will need to adjust quickly to the NFL game. Still very raw and needs to learn to use his hands better. Gets too high off the snap and has some bad habits. Has never had much high-level coaching.